↑ Harley, Raymond M.; Atkins, Sandy; Budantsev, Andrey L.; Cantino, Philip D.; และคณะ (2004). "Labiatae". In Kubitzki, Klaus; Kadereit, Joachim W. วงศ์และสกุลของพืชมีท่อลำเลียง. VII. Berlin; Heidelberg, Germany: Springer-Verlag. pp. 167–275. ISBN 978-3-540-40593-1. ↑ Bunsawat, Jiranan; Elliott, Natalina E.; Hertweck, Kate L.; Sproles, Elizabeth; Alice, Lawrence A. (2004). 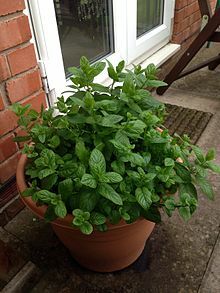 "Phylogenetics of Mentha (Lamiaceae): Evidence from Chloroplast DNA Sequences". Systematic Botany. 29 (4): 959–64. doi:10.1600/0363644042450973. JSTOR 25064024. ↑ USDA GRIN: Mentha cordifolia Opiz ex Fresen. หน้านี้แก้ไขล่าสุดเมื่อวันที่ 25 มกราคม 2562 เวลา 10:22 น.